CSPA students David Groves, Jr. and Jordyn Hale, both of Danville, are supporting the future success of first-generation students by facilitating and increasing college access and college persistence. SIUE’s diverse CSPA program prepares students for entry-to-mid level positions in college administration, such as in student affairs, academic advising or admissions. It requires internship experiences to allow students the opportunity to actively engage contemporary higher education issues facing today’s college students. “I want students, especially first-generation minority high school students, to understand how important it is to prepare for college as early as possible,” Hale said, who is currently gaining experience through her work with students in the SIUE East St. Louis Charter High School. According to CSPA Program Director Pietro Sasso, PhD, students who pursue this area of study demonstrate excellence in servant leadership. “With a particular emphasis on social justice, our students often are committed to serving historically underrepresented populations in higher education,” Sasso said. “Through graduate assistantships, they gain a deep understanding of the diversity of college populations, their experiences and the complexity of higher education. For more information on SIUE’s College Student Personnel Administration graduate program, visit siue.edu/grad/college-student-personnel. 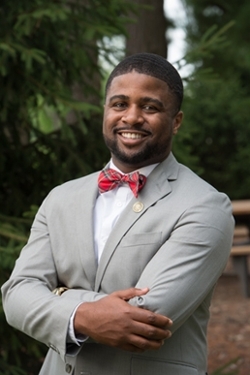 Photo: David Groves, Jr., who’s studying college student personnel administration at SIUE. 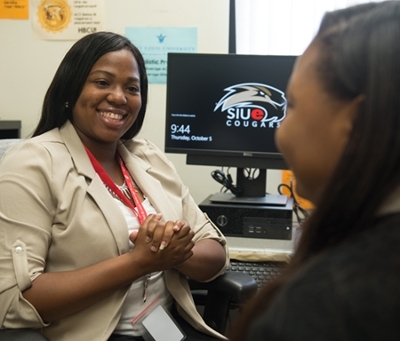 Jordyn Hale, a college student personnel administration graduate student at SIUE, is assisting in increasing college access and college persistence among SIUE East St. Louis Charter High School students.